In the previous article, we’ve looked at gameplay from the perspective of a symbolic system that proposes abstract problems to players, and that requires structuring norms while allowing for variation and uncertainty. 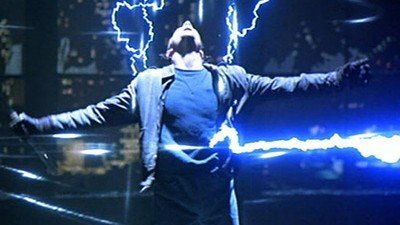 I commend you if you survived through part one and its heavy-handed theories, now is the time to explore this approach and see how it can inform the technique of game design. 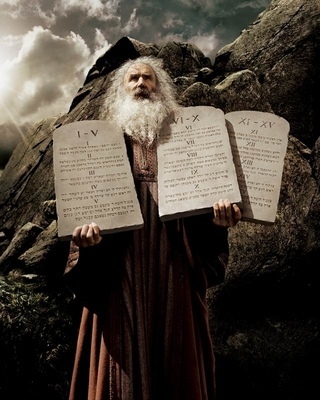 Symbolic systems work within the constraints of high level rules. Like music function with harmonics and rhythmic scales, gameplay should also have its own set of governing principles. Now, it is quite a responsibility to state such laws and this proposition is in no way definitive. It is rather a contribution to a collective effort of defining our craft that I invite all to participate in. Here are the principles that I believe need to be observed when creating gameplay. They shouldn’t come as much surprise, but they are nonetheless important to keep in mind. Fairness: Each player (or starting position) should have equivalent chances to win, or roughly equal. This applies to symmetrical games like Capture the Flag, slightly asymmetrical ones like Chess and Starcraft or games that propose widely different roles like Left 4 Dead. Consistency: Game systems should demonstrate causality and consistency. Games should propose systems with reproducible behaviour. Even if their logic might not be initially obvious, players should be able to establish a mental model to make informed decisions. Games should still allow for uncertainty though as they might lose any entertainment value if they become too predictable. System clarity: A game should contain all information necessary to evaluate a position and determine the correct play. Granted a valid mental model has been established, no element required to make the right decision should be missing from the game. They can be hidden or cryptic, but like a puzzle or an exercise of mathematics, the rearrangement of the elements provided should be sufficient to find a solution. Strategy balance: All available strategies should have relevance and value, while none should be dominant and without counter. Useless strategies are counter-productive, while unstoppable ones just outright destroy any game. Payoff balance: Reward should be proportional to the risk incurred. A powerful item should be difficult or risky to obtain, a safe path should bring limited rewards. Typical examples are games like Roulette, where the payoffs are aligned with the odds or multiplayer games where the most powerful items are in exposed locations. Skill relevance: Skill should represent an advantage, and the most skilled player should have more chances to win. Games are activities or learning and personal betterment, they should promote the research of optimal play and thus increase the chance of winning of skilled players. Respecting all these principles is sometimes difficult, and it is interesting to note that competitive games often balance an unfair situation by adding meta-rules that encapsulate the game itself. This is the case with Chess competitions that have matches based on multiple rounds. For each match, multiple games take place and players alternate between the two sides to account for the advantage white has of playing first. Alternatively, games can deliberately decide to stray from these principles for artistic, entertainment or accessibility purpose. It is the case with catch-up mechanics, common in games with a mass-market target like the Mario Kart series. It also is a strong way to make an artistic statement. For example, the game Cart life provides a confusing gameplay to convey the difficult experience of adapting on the fly to life-changing situations like immigrating to a foreign country. Tampering with these principles is rather risky though, as they might break the game dynamic, the challenge, or make the player experience difficult. This should be reserved for experienced designers and those new to the discipline should exert caution and stick to those principles as much as possible. Games are made of a multitude of elements in interaction. Adding, removing or modifying any of them can have very important impact on the way games operate and on what they offer players. The emergent nature of gameplay makes creating a game by juxtaposing features quite risky, because even if they seem interesting on their own, their interaction may create broken dynamics. It would be similar to throwing words together hoping that a sentence would actually mean anything. In order to shape the emergence of a clear enough gameplay for players to understand, I recommend first establishing a target before choosing what element to include in your game. I call this defining the “winning play” that players will have to learn, as well as its different variations that they will explore along the game. 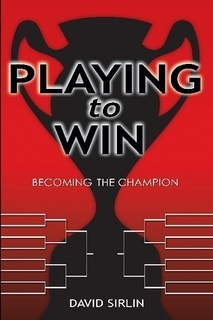 A winning play is a unitary way to be successful against a specific challenge, one technique the player has to learn to solve a type of problem. 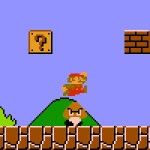 In Super Mario Bros, the key principle to kill monsters is to jump on their head. It will suffice to dispose of the simplest enemy, the Goomba. But soon, Mario faces Koopas that take two hits before being defeated, or Spinies, enemies with spikes that can’t be jumped on. After having assimilated the case or reference, the player faces more complex situations that add steps on top of the initial winning play scenario. A winning play should be established in the early stages of a game and repeated enough times for the player to assimilate before increasing complexity. In Gears of War 2, Marcus Fenix states it during the first moments of the game as he teaches the ropes to a new recruit. This golden rule is not simply about learning the controls of the cover system, but instead about the tactics built around taking cover. The game is tuned so that fighting in the open is a losing strategy, and the first encounters are set to illustrate and teach the importance of cover. Then other systems are factored in and more complex concepts appear. Enemies also take cover and, because they can be revived by their teammates when downed, a static strategy behind protection becomes a stalemate. This introduces the concept of flanking in order to nullify their cover and kill them before they can be revived. Finding the vantage point and reaching it is one additional step to take before putting yourself a winning situation where you can gun down the opposition without risk. But what if reaching a flanking position will put you in the open and draw too much fire to you? Then maybe you can wait until the enemies reload, create an intermediate cover or incapacitate enough of them so you can dash to position while they get revived. All game elements are designed to make this situation the recurrent theme of gameplay, and the player learns the basic rule: Fighting an enemy from cover is a winning situation. Then as situations get more complex, he learns all the tricks to put himself in the conditions of the winning play. Furthermore, multiple game features point back at that key challenge of taking cover, making the whole experience coherent and consistent: Shields that let you plant a cover where needed, enemy to be used as meat shield, invulnerable rock worms to hide behind as they move which let you access a vantage point… All contribute in and deepen the concept of cover, lending a symbolic nature to gameplay that make it a focused learning experience. As elements “magically” fall into place, the player is bound to experience his very own “Eureka!” moment as he figures out the pattern you designed for him. If you consider a game as a learning tool, then designers should figure out what the lesson is before building the curriculum. Stating that winning play and defining all the variations to that rule will ensure that your game provides a clear and comprehensible concept to the player. It will also give you a target to aim for when implementing your game mechanics and will help to select ideas and features by evaluating how adequately they factor into a coherent gameplay. Within a game’s construction of moving parts is one more notable than the others: the player, with his or her drive to evaluate the system and find solutions to implement. Designer and competitive player David Sirlin describes a game as a debate between players using the game as a language and plays as argument, trying to find which strategy is the best (Playing to Win, 2000). Through this research of optimal play it is possible that the discussion moves beyond the direct satisfaction of the winning conditions. A different point of contention appears: the true form of gameplay. Even though the rules of Chess state that you win by checkmate, putting constant pressure on the enemy king will most probably not lead you to victory. Street Fighter is not about taking your opponent’s health to zero but rather, as Sirlin explains, about reading your opponent’s intentions, controlling space and pressing an advantage. Similarly, the true form of Tetris is not to arrange falling tetrominos to clear lines, but instead the higher level dilemma it proposes is to choose between two strategies: To hold off and wait for opportunities to clear multiple lines at once to score more points, or to clear them at any occasion possible to create more breathing room and avoid a game over. Although very limited, all the features of Tetris contribute to this choice between short- and long-term. Game speed gradually increases with music pace as feedback, making you reconsider your strategy as the board gets more cluttered and pieces fall faster. The display of the next piece also informs your choice, and some versions let you hold one piece deepening even further the core question. The way all game features converge toward a unified issue is what provides a symbolic nature to gameplay and make it interesting to engage with. Once again, a deliberate approach is recommended so as to give a clear target to our design efforts by determining the true form we want to see appear. This top-down approach receives frequent resistance though and it is not uncommon to hear students and design veterans advocate for gut feeling and a more “old-school” attitude. While I wouldn’t dare argue with genius and pure inspiration, I believe that having a process that lets you plan ahead and discuss decisions before committing seems reasonable. Minecraft is often cited as an example of a successful game based on “emergent gameplay” (which I think is a pleonasm) and an argument against an organized top-down design approach. While its world generation is largely random, its game systems still display a large amount of structuring rules in the form of item recipes, creature AI and resource distribution, to name a few. This lets players make their own assumptions and verify them in an experimental manner through interaction. It is the alliance between structure and variation that is at the core of gameplay and we will explore how it applies to its design in the following part of this article. The defining element of a game is its set of rules which provide structure to play, an explorative behaviour of the player. As a symbolic representation of a problem, gameplay must offer a clear and pure abstraction that eliminates distraction and let players establish a mental model and carry on his or her research of solutions. This is why game systems should be consistent, and behave in a predictable fashion to allow an experimental approach so the player can ultimately understand them. Clarity is also a typical source of structure and supports the symbolic nature of gameplay. Implementing winning plays with binary success conditions helps establish clarity and the development of a mental model. 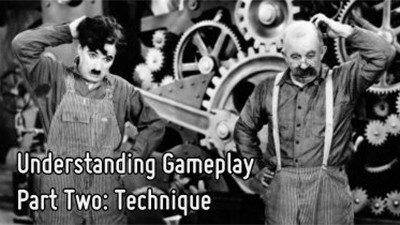 It is especially important for game mechanics that are central to gameplay. For example, jumping on an enemy in Mario is a binary event, and even in a first-person shooter with a wider freedom of movement hitting a target is treated in a binary fashion: you either hit or you don’t, the effects are all-or-nothing and there are no flesh wounds. It is notable that the notion of feedback clarity for your actions is one of the conditions that Mihaly Csikszentmihalyi establishes for an individual to enter a state of flow (Flow: The Psychology of Optimal Experience, 1990). This seems to indicate a link between the structured quality of gameplay and its properties regarding motivation and engagement. Player choices themselves can be structured, and should appear as deliberate in order to reinforce the symbolic nature of gameplay. By designing the game systems to create cascading decision branches for the player, we can consolidate true form and let a coherent point of contention appear to the player. The true form of Starcraft’s gameplay is to distribute resource between the development of economy, army or technology. The way harvesting is structured both in systems and location create discreet jumps that force a deliberate choice from the player with sustained consequences over time. Mineral patches and gas geysers are always arranged together in a base-shaped setting called an expansion. Because mineral patches can only support a limited amount of harvesters, a player trying to increase his economy will have to develop to a new expansion by building a base and a set of harvesters. Because of the required investment in resources and time, the economy of an expanding player will effectively increase only after a few minutes, leaving him vulnerable to any opponent who selected to invest in an army to attack him. These discreet jumps in efficiency are the structure that creates clear interplay between player strategies. Starcraft 2 features the same type of deliberate choices in the technology development path. High tier units such as the Protoss’ Colossi require multiple buildings to be constructed, and only fully pay off after additional research is done and enough are built, leaving you open for a lower-tech attack in the meantime. This is similar to the way advanced special moves require EX meters in Street Fighter 4, or even the fact that jump attacks that can’t be blocked with a low guard force you to go airborne, and thus be on a predictable trajectory. Gaining an advantage requires a commitment and strategy would be irrelevant if it was possible to change options without cost. These elements of restriction and structure are the grammar of the discussion between the players Sirlin describes as competitive play. As mentioned in earlier articles, variation, uncertainty and freedom are essential to play and fun. 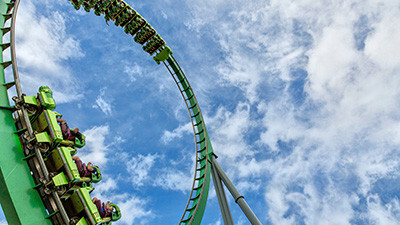 Witnessing unpredictable events creates excitement and engagement as proven by studies on variable reward patterns, yet a fully random situation has limited interest as a game environment. Let’s look at how balance between variability and structure can provide interesting gameplay. Randomness is the most immediate source of variability, and it is notable that the unpredictability it introduces is generally frowned upon by dedicated players, especially in competitive circles. It is true that a game that would be decided by a dice roll would basically throw out of the window most of the principles we’ve enounced in the first part of this article, especially consistency, system clarity and skill relevance. Such a game would give an extremely limited value of player actions and although it could be entertaining, it would not have much potential in terms of competency development. Randomness is valuable as a way to introduce unexpected situations that let players adapt, and is best used if players can have some control over it, impose some structure on it. At the opposite end of card game reference Magic: the Gathering, Hearthstone is a game that features a good amount of cards with random effects that can be deciding factors. The Mad Bomber inflicts three points of damage spread randomly on the board as he is played. 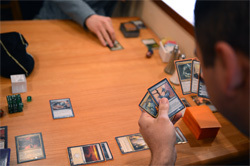 This can seem damaging to the competitive value of the game, by removing control from the players and thus minimizing skill relevance, but it is to be put in perspective with the fact that the game lets participants shape the situation in which they use such a card and thus shape the odds; structured variability. Players can select the right moment to play such a card and thus pick a situation where the odds are favorable. 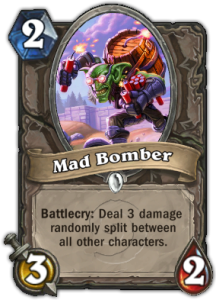 They can also affect the board using other abilities to shape so the random behaviour of the Mad Bomber has higher chances to be beneficial. Because building your deck of cards is part of Hearthstone, players can also shape the odds of having the right combination of cards to maximize effects, even if they are random. In fact, building a deck is structuring variability by itself. This is similar to the different types of games of Poker where the choices players have can be used to structure variability by betting amounts of chips in relation to the odds of winning and potential pot payout. Structuring variability is the core of player actions in such games. Execution is another type of challenge that brings uncertainty into a game. Having to master a system based on physics or on real-time constraints is a valid way to introduce variability into a game. It is important to note that the depth of the resulting challenge is linked to the complexity of the system itself and so will the skill cap of the game be. Depending on the targeted audience, the desired level of complexity might vary, and if building a complex enough simulation is out of reach, additional depth should be introduced by supporting features. Real life is a rather complex system to master, and this is what makes the sport of Archery deep enough that enthusiasts can dedicate their whole life developing their mastery of it. By contrast, even if the physics of a game like Quake are quite complex, players tend to achieve very similar degrees of shooting accuracy at the highest levels, and this mechanic loses relevance as a deciding factor. The presence of an additional level of challenge through map and item control increases skill differentiation for this game. This is probably what makes Quake deep enough so players can still be engaged in its mastery almost twenty years after its release. Simple systems used in conjunction can also be a valid way to create uncertainty. If multiples of them interact and feed back into one another, the ensemble can create initially unexpected behaviours. Figuring out how they function together then becomes a challenging and rewarding activity. The way interconnected systems work is typically depicted using the butterfly effect where one small localized cause can have drastic consequences across the planet. Very simple and easily predictable independent systems can sometimes synchronize and have results that go way beyond initial estimations. It is the case with the resonance phenomenon, when oscillating waves can see their energy amplified when they match in frequency and destroy structures of different sizes, from a drinking glass to a bridge or a building. To an extent, rocket jumping is an example of how different systems can interact and provide results out of the initial scope, sometimes even of the game developers themselves. 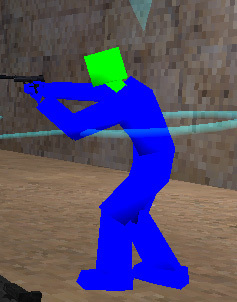 This possibility wasn’t planned for when it appeared in Quake, but it gradually got adopted and incorporated in a deliberate fashion with the addition of the battle suit item that cuts on splash damage to encourage players to move around by shooting themselves through the air, or through level design actually designing space to make that option more relevant. The cancel mechanic that first appeared in Street Fighter II as a bug was capitalized on in later games of the series, becoming a hallmark of fighting games at large. As discussed earlier, it is best to plan for these emergent behaviours and introduce the different systems through the atomistic exposition of the winning plays that a player can gradually learn before understanding how they combine them. The notion of information availability is a defining characteristic of games as established by game theory. Games of perfect information like Chess let the whole game state be completely visible to all players at all times. Games of imperfect information limit the perception each player has of the situation, introducing a dose of uncertainty that forces participants to work with assumptions. These games should make sure enough information is communicated between the players in order to structure the possibilities and give tell-tale signs to allow attentive players to make the right choices or the employ deception. In Poker, bets are shared information so the involvement players make in the pot can be used to evaluate their hand strength and bluff becomes possible. Without this exchange of information, the game would become too uncertain and no winning strategy could be developed. 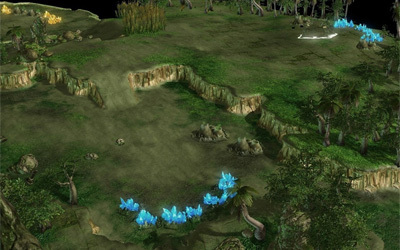 Strategy games like Starcraft typically use fog of war to restrict information access. Obtaining information becomes a key part of the game as very strong strategies that can be developed and require specific reactions. This is why dedicated scouting tools are made available to players. The fact that strategies require a thorough investment in time and resources to be efficient is what makes scouting and bluffing relevant in such a game, as we described earlier when we explained the value of structuring deliberate player choices. A high amount of available options is also a source of uncertainty that is frequently used in games. Wide variety of choice can create a large space of possibilities that is worth exploring for dedicated players. For example, Chess offers many different moves each turn and the number of different games is said to be astronomical. If the options offered to a player lack strategic relevance, selecting the right move can be quite confusing as the process becomes purely computational, better handled by a machine than the human brain. If the choices follow different strategic themes, players can operate at that high level to first select an approach. This gives them a subset within the pool of options so they can then evaluate solutions at a tactical level. This distinction in level of abstraction allows a large amount of choices to be offered to players while organizing them within thematically meaningful groups that help the decision process. It is best achieved by the establishment of true form and by ensuring that the choices of a game combine into the different high level strategies you want to offer players. Designing a game is akin to composing a song: we define the winning plays and their variations like a musical score sets a theme and its evolution. These structures need to be respected by the performer (player or musician), but also allow for some improvisation on the norm. We’ve proposed a series of principles for the design of gameplay and also introduced the notion of true form that describes the point of contention that emerges from the interaction of game dynamics. Lastly, we observed how structure and variability must balance one another in order to define gameplay as a meaningful possibility space. Sid Meier describes a game as “a series of interesting choices”. Looking at this quote from the perspective of structure and variation, we can say that an interesting choice is one that proposes a clear problem but where the right answer is uncertain. I believe that establishment of winning plays and true form can create structure and clarity to engage players in exploring the uncertainty of a space of possibilities. MDA: A Formal Approach to Game Design and Game Research – R. Hunicke, M. LeBlanc & R. Zube – This research paper from 2004 proposes a framework that deals with emergence and the distinction between game elements and the resulting dynamic. Building Tight Game Systems of Cause and Effect – Daniel Cook – Although he calls his principles tightness and looseness, I think we’re talking of the same things.